The FCBA held its annual meeting and dinner on December 6, 2018 at SKY Armory in downtown Syracuse. FCBA President Mitchell J. Katz, a partner at Barclay Damon LLP, welcomed the dinner’s approximately 110 attendees. FCBA President-elect Joann Sternheimer introduced the year’s 3 Scullin Scholars. This year’s awardees were Kimberly L. Philip of Albany Law School, Kathryn M. Gantley of Cornell Law School, and Collin M. Carr of Syracuse University College of Law. In 2005, the FCBA established the Honorable Frederick J. Scullin, Jr. Scholarship Program to recognize exemplary law students who attend the three law schools within the Northern District of New York. 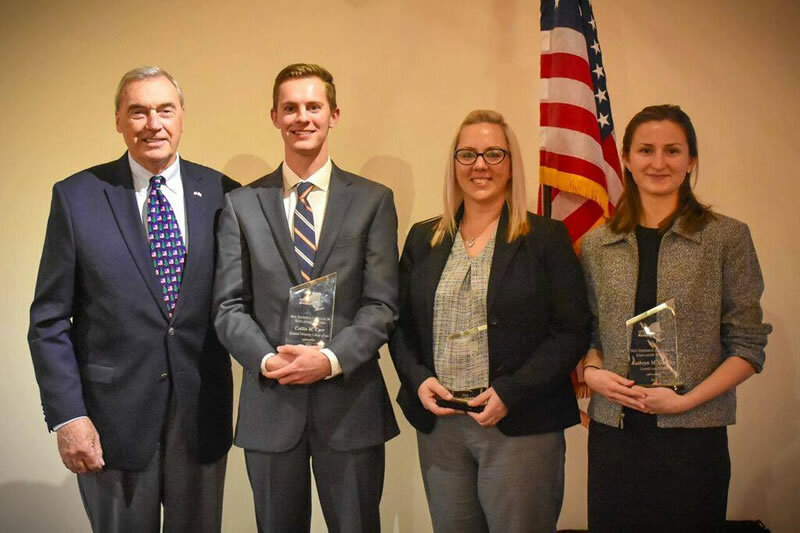 Senior United States District Judge Frederick J. Scullin, Jr. with the 2018 Scullin Scholars, (front left to right) Collin M. Carr of Syracuse University College of Law; Kimberly L. Philip of Albany Law School; and Kathryn M. Gantley of Cornell Law School. At the dinner, the FCBA also recognized more than 50 attorneys for providing pro bono legal services in 2018, including attorneys who served as trial counsel for plaintiffs who could not afford to hire their own attorneys. The evening’s guest speaker was Robert J. Searing, a curator of history for the Onondaga Historical Association. Professor Searing delivered an entertaining presentation on the history of beer brewing in Syracuse, which was nicely supplemented by samples of Congress Beer. The beer was brewed in Syracuse from the 1890s through 1962. 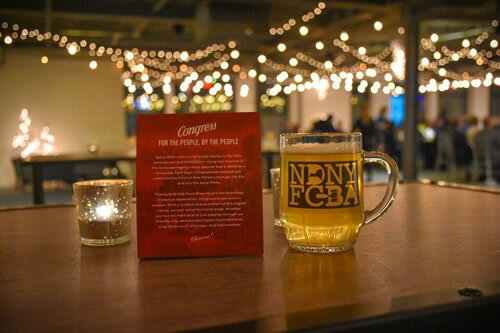 The Onondaga Historical Association recently partnered with a local brewery to relaunch the beer, which was served at the dinner in FCBA glass mugs that attendees were able to take home as party favors. The following law firms sponsored the 15th annual dinner: Blitman & King, LLP; Carter, Conboy, Case, Blackmore, Maloney & Laird, P.C. ; Coughlin and Gerhart, LLP; Hinman, Howard & Kattell, LLP; and Porter Nordby Howe, LLP. Constitutional Scholars Program ESSAY CONTEST CALL FOR ENTRIES! Federal Court Bar Association, Inc. Please note that the website for the U.S. District Court for the Northern District of New York is located at www.nynd.uscourts.gov.